Since the markets are closed today we thought we would post a couple of website statistics. Below is a chart of the type of device used to access the website. 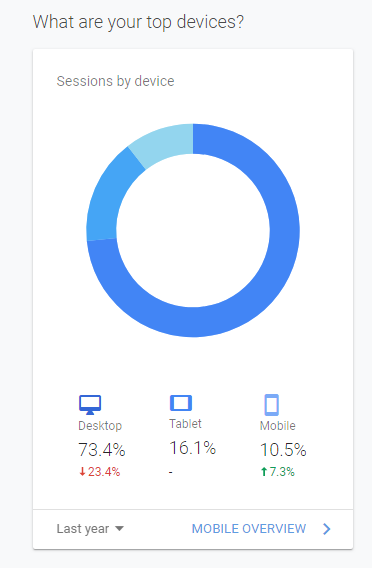 As you can see for last year over 73% of visits to the website were made on a desktop computer. This isn’t surprising to me because for the 13 years that I have been publishing websites like this one the lions share of traffic has come from desktops–although it has slowly been falling over that time. I think that obviously the demographics of the website visitor to this site skews to the above 50 crowd-we are the ones maybe at home accessing the site. The youngsters are at work or simply have no interest in income securities because they think (probably wrongly) that they can beat our performance with common stocks. The other “fun fact” to share today is simply — which is the most popular page on the website (other than the homepage)? It is the “Reader Initiated Alerts” page. This is kind of a surprise to me–I didn’t realize it was so popular with 1000’s of visitors every week. The page is here. Once I noticed so much good info from smart folks I set it up on one of my monitors to be on “fulltime”. Readers can usually find info on new issues etc., faster than I can read my RSS feeds and get the alert posted. Plus folks post info on some oddball issues that may be of interest to many. Just a reminder to all that markets will all be closed tomorrow, Good Friday. This includes equity markets as well as bond markets. Looks like we have to find another way to entertain ourselves for a day. UPDATE–we should note that bargain hunters have come into the Washington Prime Group preferred. The WPG-I issue is up $1.45 and the WPG-H is up $1.34. This on fairly heavy volume of 40,000 and 108,000 respectively. Honestly there aren’t many shakers and movers today in the income security arena, but as always there are a few. Some of the shippers today are off in the 1% area–probably just normal noise. The Tsakos Energy Navigation 8.75% preferred (TNP-D) issue has been off 1-2% at $22.64 now. The Safe Bulkers 8% preferred (SB-C) is off about 1% at $21.75. Given the run these have had since the December lows a breather is in order. Also we see the NuStar 7.625% fixed-to-floating (NS-B) is off 1% and is off $1.50 (6%) in the last 9 trading days–don’t know what is up with this one–doesn’t appear to have news or ex dividend dates affecting price. It is now at $21.11. The new Energy Transfer (ET) is now trading on the OTC Grey Market and with 11 million shares trading is at $24.91–under ticker ETPEP. We are considering getting some of this to hold for a 1-2% rise in price–would only be a short term deal for me. Midstream MLP Energy Transfer (NYSE:ET) has priced their most recent fixed-to-floating rate preferred units with an initial 7.60% coupon—about as expected. The coupon will be fixed until 5/14/2024 at which point the coupon will float at the rate of 3 month Libor plus a spread of 5.161%. This spread is quite superior to the other 2 preferred unit issues that the company has outstanding–the currently outstanding issues have spreads of 4.738% and 4.53%. The company will sell 28 million units–a fairly giant issue, with another 4.2 million units available for over allotment. The issue is rated Ba2 by Moody’s and BB by Standard and Poor’s–not investment grade. Dividends will be cumulative, but will not be qualified for favorable tax treatment. Of course there will be a K-1 issued to the investor at tax time. The permanent ticker symbol will be ETP-E when the issue moves to the big board–in the meantime it will trade on the OTC Grey Market under the temporary ticker of ETPEP. The preliminary prospectus can be read here. We will watch pricing tomorrow on the Grey Market and if it trades in the $24.75 area we will be buying for a shorter term potential 2% gain–into the $25.25–$25.40 area. Giant MLP Energy Transfer (NYSE:ET) has announced the issuance of new preferred units. The shares will be the 3rd fixed-to-floating rate unit the company will have outstanding. The shares will carry with them the issuance of a K-1 at tax time. Shares will like carry credit ratings of BB from S&P and Ba2 from Moodys–not investment grade but fairly strong. The shares will likely be issued with an initial coupon of 7.50% to 7.625%, although with a fixed to floating rate issue there are many moving parts such as the spread that will apply when the coupon begins to float in 5 years. The OTC Grey Market ticker has been announced as ETPEP which means we should see pricing on the issue tonight. UPDATE–ETP has announced a new preferred unit offering–more to come. For some that are much younger than me you may not recognize the phrase “Tension on the Tape”. This phrase was used in the olden days to describe a fictitious (in my opinion) building of tension between buyers and sellers. Supposedly the bulls and bears are battling it out and no one can gain the upper hand–a tug of war of sorts. This is supposedly resolved when the “tape” finally breaks and we have a major move in the marketplace as the tension releases. I can recall the talking heads on the old Financial News Network saying “tension on the tape” all the time–back in the 1980’s. Right now the SP500 is off .3% while the 10 year treasury yield is 1/2 basis point lower at about 2.59%. Anyway I don’t think there is really any tension, but it certainly appears that an event of some sort will come along soon to change the minds of investors out there–right now to us it is fairly ‘goldilocks’. Now if you are holding any of the Washington Price preferreds it isn’t goldilocks as their losses from earlier today have accelerated lower. The WPG-H issue is off $2.23 right now on big time volume (for a preferred stock) of 232,000 shares right now. The GasLog Partners preferred are now down 2-3% in sympathy with the common units. My best guess is they will bounce back within a few days–we have them on the watch list for a potential quick trade in the next week. The biggest preferred volumes today are in the Energy Transfer Partners preferred units. The 7.375% ETP-C units are off a little over 1%. The 7.625% ETP-D preferred units are down over 1% as well. Both issues have traded around 500,000 shares. The thrashing that started yesterday in Mall/Shopping Center REIT preferreds continues today, based on a number of recent articles in the Wall Street Journal and CNBC. Right now Washington Prime (WPG) issues are taking the largest poundings with the 7.50% WPG-H preferred issue is off $1.38 to trade at $19.15 on almost 100,000 shares of volume. The 6.875% WPG-I preferred issue is right behind it with a loss of $1.05 on 39,000 shares. These issues traded down in the $12’s in recent history so even though they may tempt some investors they may have further to fall. Of course the CBL preferred are off again–with the CBL-D and CBL-E issues off and trading in the mid $9’s. We also notice the GasLog Partners (GLOP) preferreds off today by 1-2%. We had been in the GLOP-C issue earlier this year, but took profits–a continued fall may mean we will revisit the shares. We have not looked to see if there is news here to account for the losses. UPDATE-Further checking and as mentioned by readers the company was downgraded by Morgan Stanley. It’s another snoozer of a day not only in the interest rate sensitive areas but in common stocks as well. The SP500 is off 1/10th of 1% and the 10 year treasury has moved less than 1 basis points. Yawn. We all know that after you start stringing together a bunch of days that are pretty quiet something is going to come out of the blue and send either stocks or interest rates gyrating (or both). Last week, which was pretty quiet, we picked up a couple issues and we are looking for 1-1.5% gains before selling them off. Prospect Capital 6.875% baby bonds (NYSE:PBC) took a bit of a spill last week so we got a larger than normal position at $24.87 and we see shares trading at $25.07–no immediate ex dividend in play here as it doesn’t go ex until 5/28 or so. Another nickel or dime and it could be gone–or we may just patiently hold. Also we picked up a larger than normal position in WR Berkley 5.75% baby bonds (NYSE:WRB-D) at $25.20 and are looking for the same 1-1.5% in the next week or two. It goes ex on around 5/14 so I think we will see a lift prior to ex dividend. Again if we get the chance we may exit before the ex date–or we may hold right on through and pick up the dividend–depends on price action. Both of these issues are investment grade so if we get ‘caught’ with them prior to our gain targets we are happy to hold them. Remember we don’t advocate ‘trading’, but it is fun to do sometimes. We now have our “base” positions (buy and hold) and we are doing a little capture around the base. Last week was one of the quietest weeks of the year in the stock averages with the DJIA trading in a range of 26062 to 26437 and closing the week at 26,412. Of course on Friday the big lift was from 1 stock–The Walt Disney Company which rose almost 12%. In previous weeks it has been Boeing which has moved the DJIA around–we will no longer use the DJIA as representative of “stocks” and instead will go to the SP500. The SP500 traded in a range of 2873 to 2907 which leaves the average just about 1% off a 52 week high and all time high. The 10 year treasury traded in a range of 2.46% all the way up to 2.56% which was the Friday close. The FED balance sheet rose in assets by $2 billion last week to a current level of $3.936 trillion the 1st increase since the week ending 3/8. The average preferred stock and baby bond closed last week at $24.67 which is a fall of 5 cents over the previous week. Reflecting this slight move lower is that there are 245 preferreds and baby bonds trading at $25/share or lower (compared to 226 the week before). Last week we had only lodging REIT Sotherly Hotels (NASDAQ:SOHO) announce a new fixed rate preferred issue with a coupon of 8.25%. The issue is now trading on the OTC Grey market under ticker SOHEP and last traded at $25.10. As we had mentioned last week we would be more than happy to see a small setback in preferreds and baby bonds this week as we have cash to deploy. On a day with 50 mph winds and 12″ of new snow in Minnesota we are getting antsy to make a trade or two in the portfolios. I call them ‘boredom trades’. Got to be careful with boredom trades so I don’t do something stupid. We had locked down nice profits in March in many of the newer securities we bought upon issuance and right now we have just a few of the shorter term flip type securities left. These are securities outside of our “base positions” which we specifically bought to hold only a short time and then take a profit when they avail themselves (at least we hope to do that–it doesn’t always work). Fidus Investment 6% notes (NASDAQ:FDUSZ) bought Tuesday for $25.45. Now trading at $25.68. This is dividend (interest) related as it goes ex 4/30. We are looking for another nickel or dime. Global Partners 9.75% preferred (NYSE:GLP-A) bought 4/3 for $25.38 and now at $25.50. Again dividend related as it should go ex on 4/30 (for a tasty 60 cents/share) so hoping for a lift in the next 10 days or so. So 2 of 3 of these could be sold soon–today or tomorrow maybe as we are just looking for quick 1-2% gains. The other item of note is that S&P Global announced a rebalance of the S&P U.S. Preferred Stock Index effective 4/22. We know that many of you are aware of this already so it is not new news, but the rebalancing is adding 23 issues while eliminating just 3 (one of which is a $100 issue and another is a $50 issue). The only $25 issue being eliminated is the GLIBP perpetual preferred issue from GCI Liberty. This is a 7% issue (was previously a 5% issue) and it is trading at $25.45. Haven’t seen downward price pressure on this yet–but maybe it will come.